Black Milk Clothing is an Australian company specialising in nylon leggings, dresses and swimsuits. 21 months ago I decided to purchase my first piece - the galaxy blue leggings (see below). I'd never seen such high quality printed leggings before, and thought they were apt as I had just started a degree in physics. Myself on the left in my blue galaxy leggings and my sister in her purple galaxies on the day we received them. The start of an obsession! After browsing the Black Milk Facebook page for a while, I came across their 'Community' tab. To my surprise, I found a list of numerous Facebook groups created by, and for, those who were interested in their clothing. I straight away decided to join the 'Black Milk Clothing UK' group, and was accepted as a member before my first pair had even arrived. What I didn't realise in April 2012 was just how much this decision would change my life. The Black Milk community is comprised of the loveliest people I have ever had the pleasure of talking to, and in some cases, meeting. I am still unsure how a love of stretchy clothing can single out the best people in the World, but apparently it works. Since I joined the Facebook group the members have offered me advice and opinions. They've sympathised and empathised. They've supported me more than I ever thought strangers would be able to, and for that I am so grateful. I'm not sure how I would have got through last year without knowing that at least someone would be online to give me advice at any time of the day. For me now, Black Milk Clothing has become much more than a brand of clothing. I still buy from their website on a regular basis, but the community is so much more important. Since I found the community I have been lucky enough to attend several meet ups so that I could hang out with the amazing people I talk to practically every day. The founder and marketing director have even made their way over from Australia a couple of times to meet everyone who appreciates their brand. 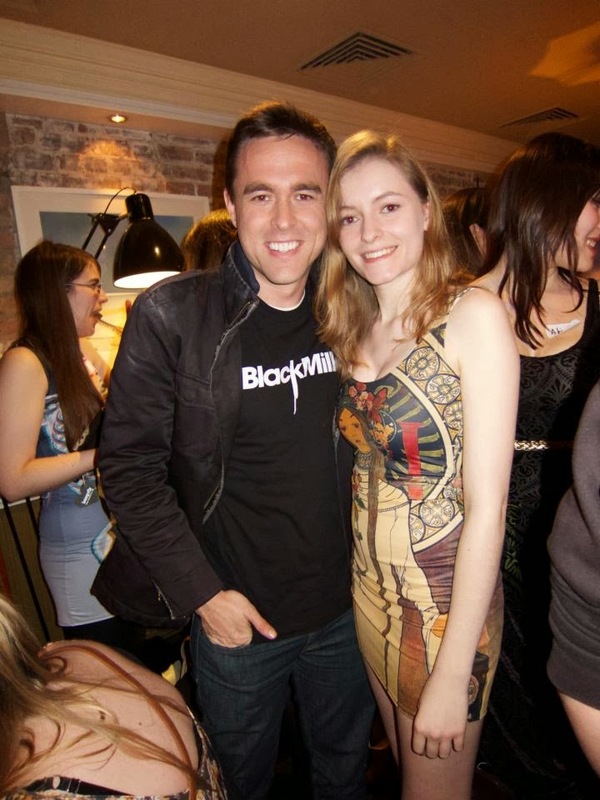 Myself with Cam (Black Milk's marketing director) in the Alphonse Mucha dress I was lucky enough to win! Nowadays my collection is approaching thirty pieces (oops!) and it's almost bursting out of its designated drawer. I look forwards to Black Milk's upcoming collections (DC, Disney and Marvel collections rumoured for this year alone!). I've joined numerous Black Milk Facebook groups, including, but not limited to, one for French sharkies (define 'sharkie': someone who 'noms' Black Milk at release time. Black Milk releases are crazy! ), one for Spanish sharkies (they help me improve my language skills), another for creative sharkies, and a discussion group for sharkies from all over the World. I am so excited for another year as part of the community.